Highett’s main shopping strip has received the Mainstreet Australia Mainstreet Activation award, recognising its transformation to a vibrant hub of shopping, living and activity. Vantage Highett mixed-use development, located on the corner of Highett and Graham Roads in Melbourne, opened in mid 2013 and represents a new type of development for this part of Melbourne. 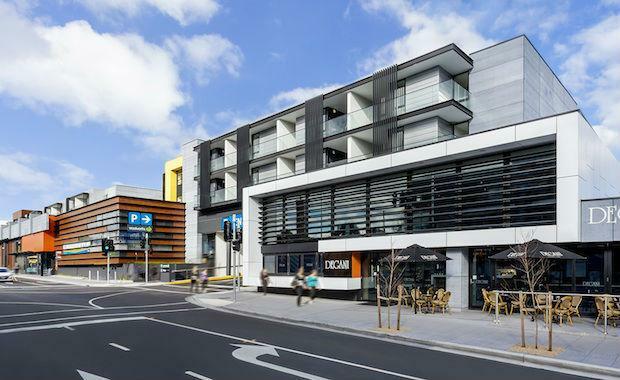 The mixed-use development comprises 130 apartments and 6,000 square metres of retail space, combining a Woolworths and retail tenancies at ground level, with one and two bedroom apartments above. ClarkeHopkinsClarke architect Toby Lauchlan said the rejuvenated streetscape is at the forefront of its kind. “For ClarkeHopkinsClarke rejuvenating streetscapes which are often seen in disrepair in suburban Melbourne, is about creating vibrant communities and injecting much needed life through design,” Mr Lauchlan said. Mr Lauchlan worked with local community, retailers and the developer to help bring to life this prominent site. “Since the opening of the site the supermarket has traded strongly and the retail tenancies are able to demand higher rents than originally estimated," said James Weight, Regional Development Manager at Woolworths.